One of the many reasons behind the invention of blockchain was the need to separate trading networks from the centralized world. 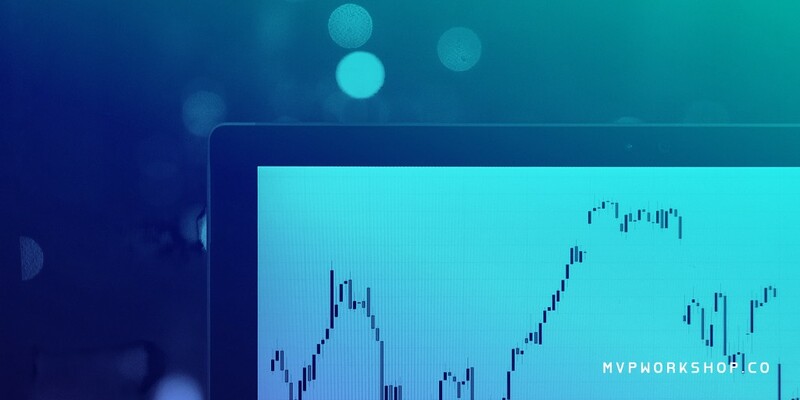 However, the current state of crypto exchange networks is somewhat of a paradox — almost 99% of cryptocurrency trades occur on centralized exchanges such as Binance, Bitrex, and Coinbase, which goes directly against the decentralized world of the blockchain. That poses a question: Why is the world of cryptocurrencies operating on centralized networks when it was intended to be completely decentralized, and should I simply list my token on a centralized exchange? Before you make that decision, you should look at the benefits that both centralized and decentralized exchanges have to offer since there are several key aspects to consider when deciding which exchange to use and where to list your token. Centralized exchanges facilitate trading and manage people’s capital and their private keys. They are a popular choice for all newcomers to the world of cryptocurrencies due to user-friendly platforms. On top of that, they provide certain services such as margin trading and landing. Plus, they stop losses or include wallets for storing your cryptocurrencies. In addition, thanks to their popularity, they offer higher liquidity, allowing you to convert cryptocurrencies into fiat currencies faster. One of the most significant advantages of CEX over DEX for everyone looking to dabble with crypto for the very first time is that they allow payments via fiat currencies, such as bank wire transfers, as well as credit and debit card payments. Since decentralized exchanges accept only cryptocurrency deposits, CCE is a starting point for almost every crypto trader out there. Another key aspect to consider when choosing the right exchange is safety. While most user accounts are insured, centralized exchanges have been a lucrative target among many hackers due to their high trade volumes. It is worth mentioning that 5 biggest crypto hacks led to a loss of $1 billion. Decentralized exchanges eliminate the need for a middle-man (centralized exchanges); instead, they operate P2P. One of the biggest benefits of decentralized exchanges is the anonymity they provide. That has to do with the way decentralized exchanges operate — miners validate transfers and your information is only revealed to the buyer/seller if the exchange method involves a bank transfer. At the same time, miners require a much smaller fee than centralized exchanges, which makes DEXs much more appealing. You must already be wondering why decentralized exchanges are not used as often if they are that much better. The answer to that question lies in a few disadvantages of DEX over CEX. Namely, decentralized exchanges have a much lower trade volume compared to centralized exchanges, meaning that it will take some time before you can find a buyer/seller. That is a huge disadvantage for anyone looking to make a profit by playing the market. What’s more, due to much smaller liquidity, it might take a while before you can exchange your cryptocurrency into fiat. However, one thing that decentralized exchanges have going for them is that they aren’t regulated by any governing body and are not required to operate by any country’s know your customer (KYC) and anti-money laundering (AML) laws like centralized exchanges. 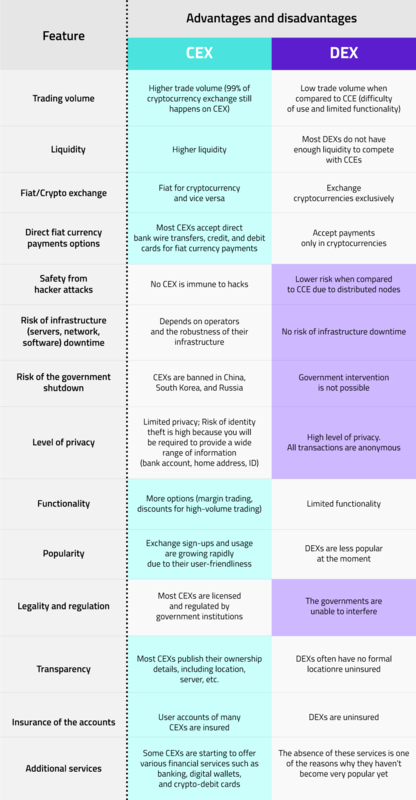 In case you still have some questions regarding the benefits of both CEX and DEX, the following table might help. Regardless of your preference, one issue that both CEXs and DEXs share with every crypto-related project is compliance with government laws. Namely, Russia, China, and South Korea banned centralized exchanges from operating on their domains and are now planning to make new laws in order to regulate and tax trades. That might be the catalyst required for better development of decentralized exchanges — their potential improvement is something you should consider when deciding where to list your token. Companies that are looking to get funded through an ICO campaign are usually the ones that require their own token. Naturally, if your project is already getting funded through an ICO campaign, it will automatically have its own coin. However, companies that are looking to realize a project that uses blockchain and cryptocurrencies as its backbone need to go through the process of tokenization. While the process is relatively simple, it is both time and money-consuming, so before you attempt to list your token, you should ensure its success by sparking the interest of different investors. One of the best ways to do that is by making your project relevant by integrating cryptocurrencies into it in a meaningful way. There are more than 1,500 tokens on the market, so your project requires ingenuity when it comes to the way it will utilize cryptocurrencies. After that, you should familiarize yourself with the basics, such as learning about your competition (tokens listed roughly around the same time you plan on listing your token) and researching if ICOs are legal in your country. When you are done and you have a good insight into the market, you can begin the listing process. First things first, your project needs to reach the exchange. If you don’t have a specific exchange in mind, you can either check out our list or find one that suits your needs best on websites like Cointelligence. By visiting an exchange’s website, you will most likely find links titled “Coin Listing” or “Apply to List”. By following the links you will then be asked to fill various forms and provide information regarding the team and community, as well as to include a description of the project. Sometimes, depending on the exchange, you will also be required to attach some documents like a whitepaper or technical report, so make sure you have both of those prepared in advance. Another vital step in ensuring the success of your coin is the PR part and how you handle the community. Many tokens may be deemed a scam by the community due to the lack of communication between the development team and the investors. By being transparent about your project and informing the community about your team, who you are, your plans, and how and when you plan on realizing them, you substantially increase the interest in your token, which, in return, attracts investors. Accomplishing your objectives leads to a bigger interest, which results in potentially bigger trading volume down the line. Simultaneously, the bigger that potential trading volume, the higher the chances of getting your token listed. After you’ve submitted all the necessary information, the exchange will then review your token in order to determine whether they want it on their exchange and if the token will actually attract said trading volume. Keep in mind that, in order to stay fully compliant with SEC (US Securities and Exchanges Commission), exchanges usually do not accept security tokens. Since the listing process may take several weeks or even longer than a month, make sure that your token passes the Howey Test. If the exchange sees potential in your token, you will be contacted in order to finalize the contract and discuss the listing price. The table below shows the current situation and the cost of listing your token. As you can see, listing can be quite expensive. While some exchanges don’t disclose the fees publicly, they will contact you in private to discuss the price of listing your token. However, keep in mind that the fee doesn’t only vary from exchange to exchange but also from project to project. Moreover, even the exchanges that are labeled “free” charge a fee for things like audits or blog post announcements, and so on. If you have read everything and reached the end of this article, you should have the basics covered. You should know the biggest differences between centralized and decentralized exchanges, and what you need to prepare in order to list your token. You should also have a general idea about doing it and boosting your chances of getting your token listed. All that’s left to do now is take all of those aspects into consideration and make a decision that suits you and your project best. This article is part of our blockchain awareness posts where we try to help newcomers and businesses interested in blockchain use cases enter the space more easily. Follow us and subscribe for more upcoming articles such as this one, and feel free to join the conversation on Twitter and LinkedIn. For free business consultation about how blockchain can impact and change your business model, or anything else related to the technology — get in touch with us. How to List a Token and Where — Differences Between CEX and DEX was originally published in MVP Workshop on Medium, where people are continuing the conversation by highlighting and responding to this story. Hybrid Gaming – How is Blockchain Affecting the Gaming Industry?